There are many cookies in my repetoire. Chocolate and ginger, biscotti, florentines, the sort of famous peanut butter cookies. But, rugelach I’ve made for years. It started early with my great-grandmother Agatha, who taught me to roll up rugelach for the Temple Sisterhood bake sales. It was one of those recipes I made all through college, baking in the toaster oven in the dorm kitchen. It’s a great cookie, lasts a long time (sure it does….) and can be mixed, rolled up and baked off without having to go to the store for any special ingredients beyond a brick of cream cheese. In fact, it was a review of the larder and an obvious overload of preserves last year that got me thinking about rugelach as a technique – one of many way to use all that deliciousness in those jars and jars and jars of jam. I made granola bars, fregolattas for every get together. And I made rugelach. Making rugelach is best accomplished in this order. Make the dough in the food processor during dinner prep. Put one dough disk in the fridge and put the other in the freezer for another day. 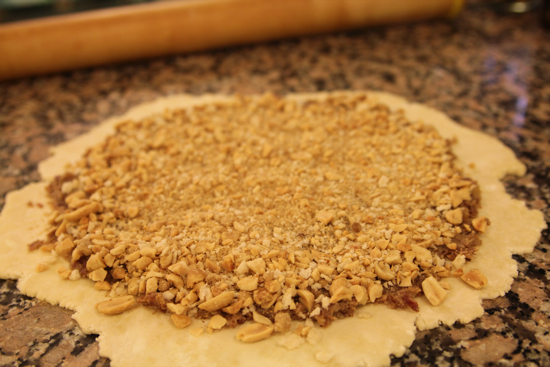 The next morning, after the first cup of coffee and before life interferes, roll out a disk of the dough, spread the jam, sprinkle the crumb/nut mixture. Slice, roll and place on a sheet pan. Freeze. That night, as you’re thinking about dinner and after you’ve poured yourself a drink, stir up an egg yolk with some sugar. 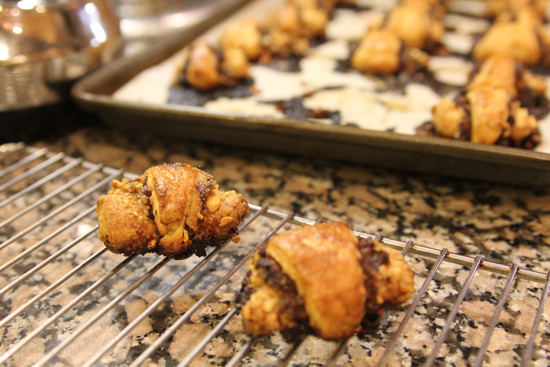 Paint the rugelach and bake them. There you go. Happy cookie. Marrying Charcutepalooza and Rugelach, I made Bacon Rugelach. God help me. As I began my holiday cookie and candy making, the planning, the lists, the counting… and I thought about rugelach to tuck into each cookie box. I returned to a slightly loony idea I’ve been playing with for awhile. I’ve tested this recipe a couple of times during the Year of Meat. It all started with bacon jam, an idea that sprouted after reading this brilliantly charming post by Rebecca. I made several versions of bacon jam, playing the sweet, the spicy, the onion of the jam with the cure I used for the bacon. The particular alchemy that thrilled me? Pomegranate molasses and coffee cured bacon. The tart sweet spice went to a very happy place when salted peanuts were sprinkled over the jam. 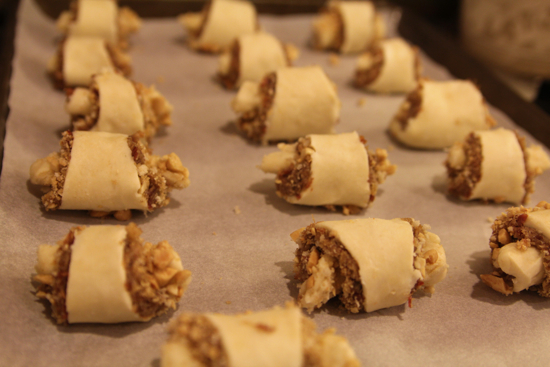 And some breadcrumbs, because Agatha’s rugelach always includes breadcrumbs. And that heavenly cream cheese dough. Because I know this is a wild idea, I’m also giving you a perfectly sensible raspberry pecan rugelach. But if you’re feeling sassy, bacon jam is a lovely thing, and these trayfe rugelach are a deliciously surprising appetizer. Makes 2 disks. Each disk makes 16 cookies. Pulse the cream cheese, butter and flour in the food processor until it creates a shaggy ball. Scoop out the dough onto a flour coated counter top, divide, forming two disks. Wrap each disk in wax paper and chill overnight. 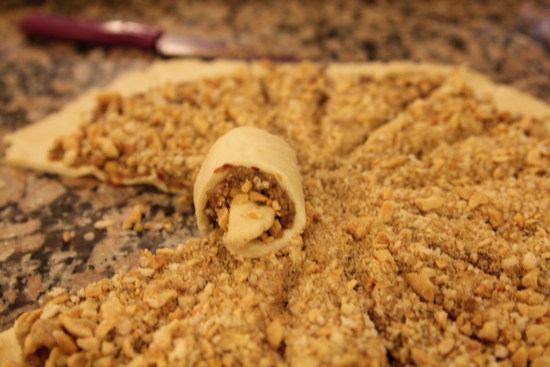 Roll out the rugelach dough into a 10″ circle. Mix together the chopped nuts, sugar and breadcrumbs. Sprinkle the nut mixture over the jam. Using a sharp knife, divide the disk into 16 segments. Roll each segment, starting from the wide end, into a crescent. Place seam side down. Place the sheet pan into the freezer for 2 hours, minimum. Mix together the egg yolk and sugar. Brush the tops of the cookies with the egg. Bake the cookies for 35 minutes. Cool on a rack. Store between wax paper layers in a tightly covered storage container. Refrigerate for up to three months. Also, may be frozen. In a large, heavy (I use my Le Creuset) pot, cook the bacon until well browned. Remove the bacon to a paper towel to drain. Pour off (and save for another use) most of the bacon fat, add the onion and sauté over low heat until translucent and beginning to caramelize on the edges. Add the brown sugar and then caramelize the onions until very deeply brown. Then, add back the bacon. Add the molasses, coffee, vinegar, bourbon and pepper and bring the mixture to a boil. Reduce the heat and cook slowly, very slowly, for about 1-1/2 to 2 hours, when the mixture will be deep, rich brown and will smell divine. Taste and correct for seasoning – salt or pepper. Let the mixture cool a bit, then transfer to the bowl of the food processor and chop until fully blended. It’s really up to you how chunky you want it to be. I like a smoother texture. Pack into 4 oz jelly jars and refrigerate or freeze. speechless! I’d probably take one of each: it’s all about the balance, right? there’s not much balance in these cookies, but it’s so so worth it! This reminds me of last Chanukah, and the latkes I fried in lard. Mmmm. A real abomination. My grandmother always snuck bacon fat into the matzoh balls! Are you trying to kill me? What a brilliant combination. This is simply brilliant Cathy. Brilliant! The Temple Sisterhood appearing along with Bacon Rugelach in the same few paragraphs seems somehow conflicted, but in the best way. Only an evil genius would have coined, let alone, developed the latter which sounds delicious! Hoping savory may be on your mind with an eye to Sunday’s Cookie Swap! There is so much pressure! Busting a gut here with the Bacon Jam Rugelach! Oops — I think you left the butter out of the directions for the rugelach dough?!? OMG! I am a loss for words. The sheer audacity of bacon jam in rugelach. I can’t WAIT to try it. EASY rugelach!! I love it. And I think I’m going to follow your rugelach ‘timeline’. The bacon rugelach is pure evil and I must make that too, I’m afraid. Off to the store to get my bricks of cream cheese. Thanks for this post! I think both sound equally delicious. My great-grandmother always put lard in her pie crusts, so I did the same and they were always so flakey! Now the lard in stores also has shortening (hydrogenated fat) in it. Yuckey! So I make my own pork lard these days. One question, where is the recipe for the not smoked brown sugar and coffee cured bacon? Oh Cathy – I just knew when we shared that taxi that morning in Atlanta that there was some kind of connection (besides the fact that we both adore Carol). RUGELACH! We must make rugelach together. I don’t consider myself a baking expert, but in our house, we have mastered the technique of rugelach. Even our favorite cookie baker amongst our friends and family said ours surpassed hers. So I guess our rugelach are a legend in our own minds! Bacon Rugelach??? Ha ha ha you have Jews all over the world rolling in their graves but they look fantastic! 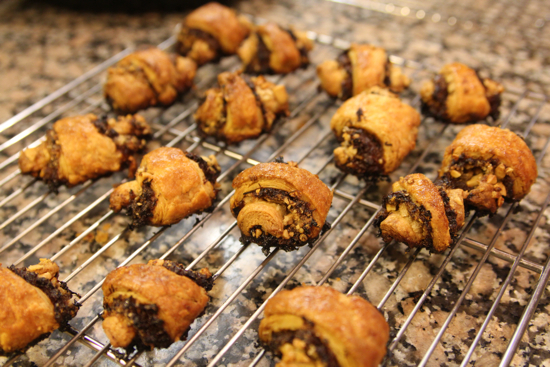 I so love making rugelach, I do, and you have me wanting to through some together again! I’m a bit bummed I missed out on the secret stash of the naughty rugelach at the cookie swap. On the plus side? I have some leftover bacon jam I made for my supper club lingering in the fridge. I might have to give this a go and bring it to the big holiday party my friends host. One is Jewish, the other is Agnostic, so it’s always a rather blasphemous mix of foods. Emily, I’m sorry too! I kept getting separated from my plastic tub of rugelach. Perfect timing. No, beyond perfect. I just smoked 11 pounds of brown sugar cured bacon…sure I’m giving some for gifts but some bacon jam was made and this is SO perfect. Thank you for this recipe but more than that…thank you for Charcutepalooza; I might not have done a lot of challenges but I will FOREVER be grateful for bacon, the resulting bacon jam and corned beef. Changed my life they did! Those look awesome!! I’m allergic to peanuts, what other nut do you think would work with the bacon jam? Thank you. I’m right in the middle of making this, and unless I’m mistaken, which is certainly possible my eyes are going, heh, you don’t say when to add the pomegranate molasses? I assume you add it with the rest of the ingredients after carmelizing the onions, I hope so, it looks fabulous so far!